Shaped largely by the act of meditation and the Zen school of thought, the Roshes are simplicity given form through design. Every element is thought out and retained to keep it down to the basics of what makes a good shoe. Channeling Eastern philosophy even further, different features of the shoe are visual representations of the different parts of a Zen garden. The modified waffle outsole is designed to look like stepping stones, as the insole mirrors a raked rock garden. Keeping this minimalism intact, the shoe has progressed from the Roshe One to the Roshe Two and even the Nike Roshe Run, while retaining the juxtaposition of seriousness and playfulness. Experience true simplicity and style by checking out the latest range of Nike Roshe shoes for women and men online at Sun & Sand Sports and have your order delivered to your doorstep in Kuwait City and the rest of Kuwait. 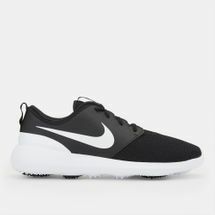 The Nike Roshe Run is a simple but elegant silhouette that fits your feet like a glove and gives you the feel of running on grass, since the shoe is built around the concept of Zen. The brainchild of Dylan Raasch, the Nike Roshe Run shoes originated through a brainstorming session back in 2010 where the aim was to add value to a lower priced model. And thus sprouted the idea of the Nike Roshe Shoes, even though it wasn’t immediately accepted. Heavily inspired by the concept of meditation and Zen, the Nike Roshe Run shoes for men and women even had their name originate from the same. Roshi stands for a title given to a Zen master and was originally the name that was supposed to be slapped across the shoe – but due to legal limitations, it had to be changed to Roshe, which still sounds the same. Designed to keep only what’s absolutely needed for a running silhouette, the other unnecessary elements were removed – after which the only thing left was to sculpt and refine the shoe. Taking the Zen inspiration to heart, the outsole used a Nike natural motion waffle pattern but was modified to give it a look and feel of stepping stones found in Zen gardens. Even the insole was designed in a way to mimic the feel of a freshly raked Zen rock garden whilst the original Iguana inspired colourway was used to play off the natural dark green leaves and moss and the off-white rocks present in a Zen garden.